Slow Cooker Restaurant Style Garden Salsa has so many delicious and fresh ingredients and uses up all of those garden tomatoes. It is so addicting you won’t be able to get enough! It is also perfect for canning. This is the time of summer where the gardens are getting full of fresh veggies. If you are wondering what to do with all of those garden veggies make this salsa ASAP! 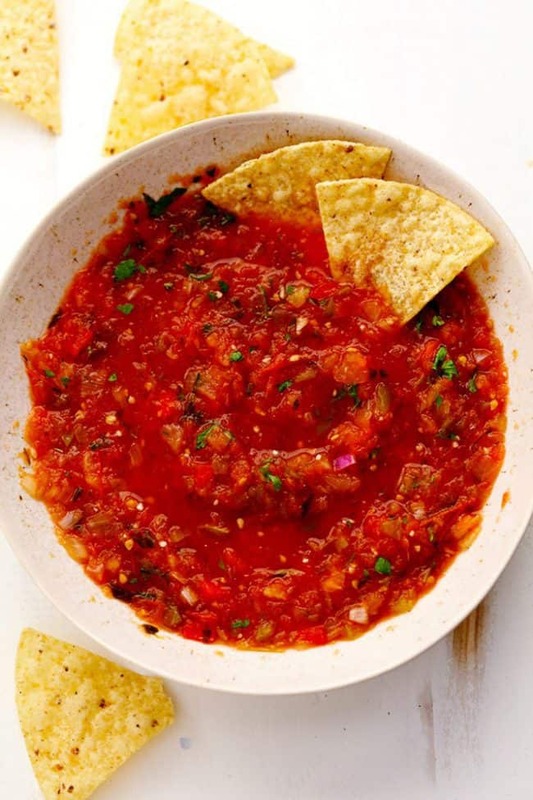 This salsa uses 7 cups of fresh tomatoes and is full of such amazing flavor. This salsa is seriously amazing. You know the addicting restaurant salsa that you just can’t get enough of it? This is that salsa and you can make it right at home! I like using the combination of tomatoes, onions, jalapeños, red and green bell pepper, and fresh herbs. These simple ingredients come together for big flavor. And you want to hear the best part? It is made in your slow cooker! Cooking it in the slow cooker allows all of the fresh veggies to blend together and bring out the flavor. 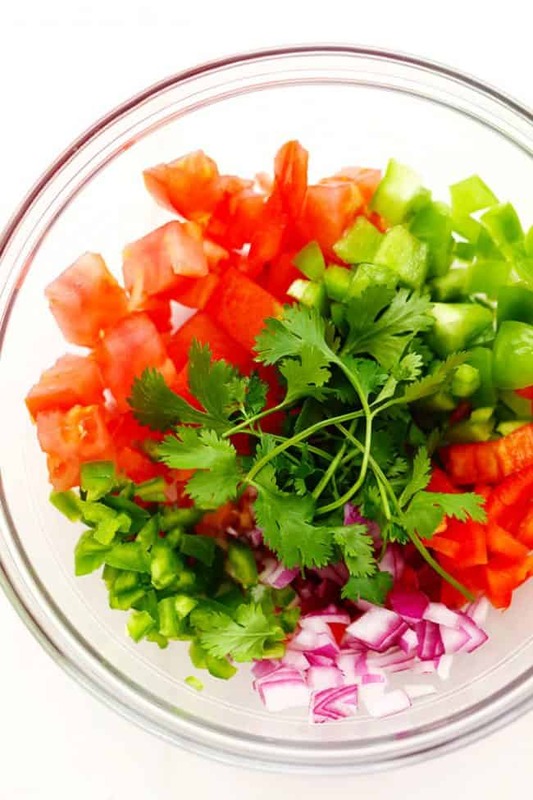 The veggies soften and create the best salsa EVER! I love the this recipe makes a lot of salsa and you are able to can it, or give it to your neighbors. 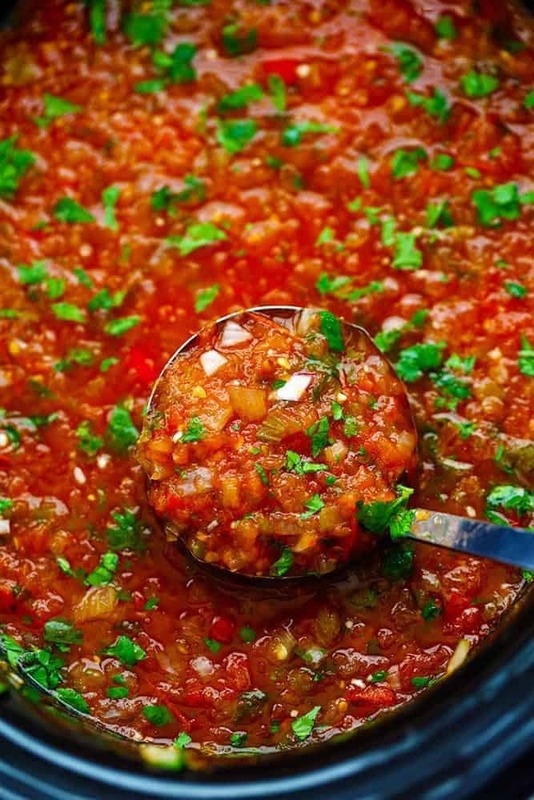 This salsa is incredible and you are going to agree that it is the best that you have ever made! I like a mild salsa so I suggest adding in an extra jalapeño or leaving in the seeds for more of a kick. This is so easy to make and only about 1o minutes of chopping are involved to create the best restaurant style salsa right in your slow cooker! Slow Cooker Restaurant Style Garden Salsa has so many delicious and fresh ingredients and uses up all of those garden tomatoes. It is so addicting you won't be able to get enough! It is also perfect for canning. 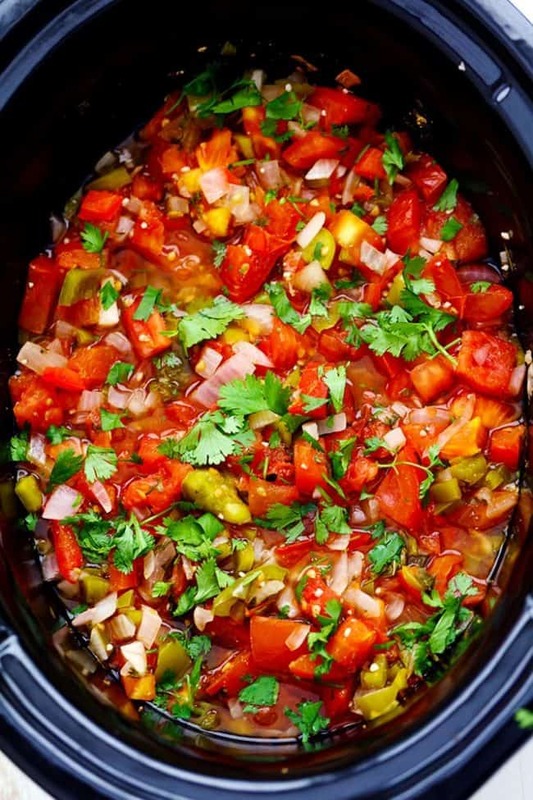 In a slow cooker add tomatoes, onions, peppers, apple cider vinegar, and coriander. Cook on low for 4-5 hours or high for 3-4. Right before it is done add in the cilantro, basil, and sage. Let it cool for a bit. Spoon the salsa in to a blender or food processor. Pulse until it is the desired thickness. Add in salt to taste. This salsa is easy to freeze or you can can it for future use. Do you think substituting half of the jalapeno peppers with peaches would work? You can defiantly customize to your taste! Curious how to can the salsa made this recipe. I am a fairly experienced canner so do you just process as you would with peeled tomatoes? Thanks in advance. Yes it is the same process. Fill hot salsa into hot jars, leaving ½ inch of headspace. Remove air bubbles and adjust headspace, if needed. Wipe rims of jars with a dampened, clean paper towel. Process pint jars in a boiling water bath for 15 minutes. You don’t need to add the lemon/salt to it? I can tomatoes and salsa every year a d never use the water bath. Boil your jars, fill hot jars with hot salsa & seal. There’s enough acid in tomatoes to be safe. Listen for the pop of the lids sealing. 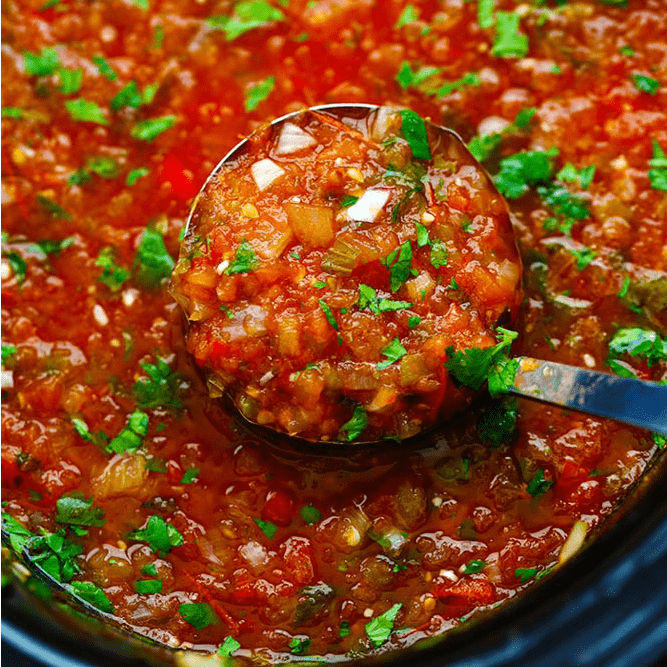 What size slow cooker did you use for the Salsa? It was a 6 quart slow cooker. Do you peel your tomatoes? You can but I didn’t. It turned out great. I just made the salsa and after the four hours it came out kind of runny! (Maybe my tomatoes were juicy)! Do you leave the lid on the crock pot…. or leave it off so it will thicken?? I’m wondering if you removed the skins and seeds from the tomatoes for this recipe. It looks amazing, and I can’t wait to try it! Easy to make and delicious!! Not sure how to can though? Could use some help with that! How long do you think this is good for in the fridge/freezer? The recipe and instructions were great, but the sage just didn’t taste quite right to us. We will be making it with more cilantro and skipping the sage next time. As someone else mentioned we did see quite a bit of water as it cooked so I just drained that off and we didn’t even need to process the salsa because we like it a little chunky and the tomatoes cooked down quite a bit. Thanks!!!! I agree, I took the sage out, you don’t see it much in mexican cooking or salsas. Delish recipe! Wondering if you use all the liquid that is created in the slow cooker when you put into the blender? I’ve just done the slow cooking part and am curious about all the liquid and if this is going to be runny? If it is runny, is there something I could add to thicken it up a bit? Can I ask about how long this would last in the fridge? Also what is the AC Vinegar for? The vinegar adds flavor but also is essential for safe canning as it increases the acidity of the salsa. how many pint size jars would this fill for canning? I’m surprised there isn’t any garlic. Do you just put it in a freezer safe container to freeze it or is there a certain process? I like this recipe, but wish you would give info about freezing or canning since it was mentioned in the recipe. My neighbor makes salsa but it is TOO WATERY! Bless his heart I know it is a lot of work but it is awful. How can this be remedied?